GRIPE April Featured Member President Amy Lin! Our association is a robust and diverse set of educators, researchers and medical professionals that come from all walks of life and from around the globe. Each month a member is chosen to highlight their academic and professional career and see how they are making the best of their membership in GRIPE. 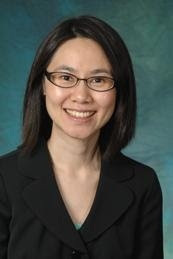 This month’s Featured Member is our newly-elected president, Dr. Amy Lin. What things would you like to see happen in your two years as president? What I would like to see is greater collaboration both within and outside our organization. Aside from gathering for the annual meeting, we could be sharing ideas, research projects and the like among members and partner organizations. I’d be interested in partnering with groups like UMEDS or IAMSE, or any other type of research-based association with a similar mission. One directive that (Past-President) Geoff (Talmon) began during his term was to expand into other health professions outside of medicine such as education in pathology. Even in those realms, we are all facing the same issues. Another avenue I’d like to explore is to talk more about the educational research aspect of our field and how we can move forward with that. We have a lot of people in our group who are amazing educators, but they don’t necessarily have a background in research. I’d like to help foster more opportunity to bring that back into the meeting and other activities during the year. Possibly even webinars or collaborative research projects. Where do you see GRIPE going in the next five years? I think we’ll be a better-known resource for pathology educators internationally. We are already seeing greater membership from outside the United States and the newly-established Membership Committee is actively working on several international outreach efforts. I see GRIPE as more than a source for instructional materials and questions, but we can also be known as a complete resource for Pathology education and educators. People can come to us for mentorship, recommendations, help with research projects and collaboration. I’m also excited about our trainee involvement initiative! Through our efforts there, we hope to recruit not just medical students into the field of pathology but medical students and residents into pathology education so that they can find their niche here. Including trainees has already helped create more of a dialogue between educators and students. Reaching across student/teacher boundaries has been instrumental in highlighting perspectives from both sides, which will make us all stronger and better able to reach our shared goals. Anything else you’d like to share with the membership? I am happy to hear your ideas for where you’d like to see the organization grow or if you have ideas on how to promote GRIPE to others. I look forward to serving the membership in 2019 and 2020. Would you like to be featured in next month’s article? Let us know by emailingsupport@gripeadmin.org.